Sundays in Spain, as they are traditionally known, are for making paella. 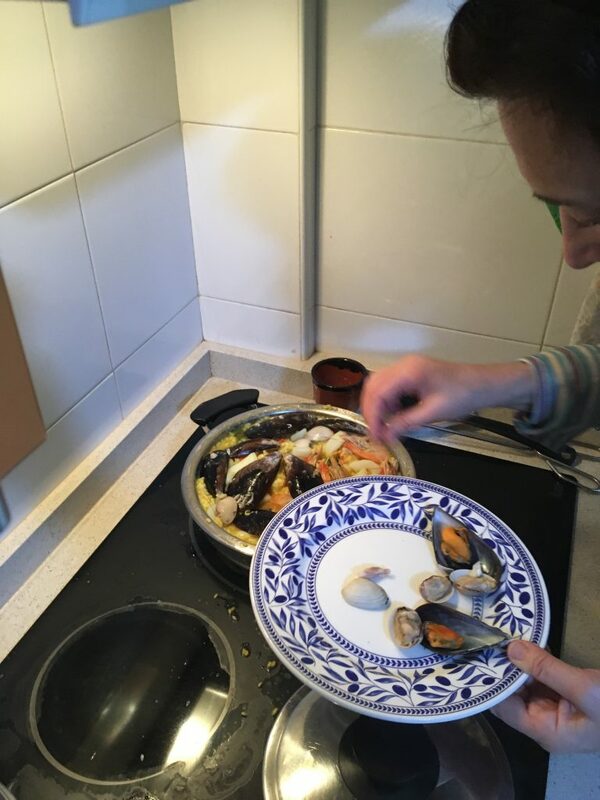 For those of you unfamiliar with this Spanish dish, it is perhaps the most well-known and best tasting cuisine you could really ask for in Spain. It consists of a delicious mixture of seafood, rice, vegetables and sometimes (although not this time) rabbit. For those of you who have had paella, you certainly understand why it deserves a blog post of its own. 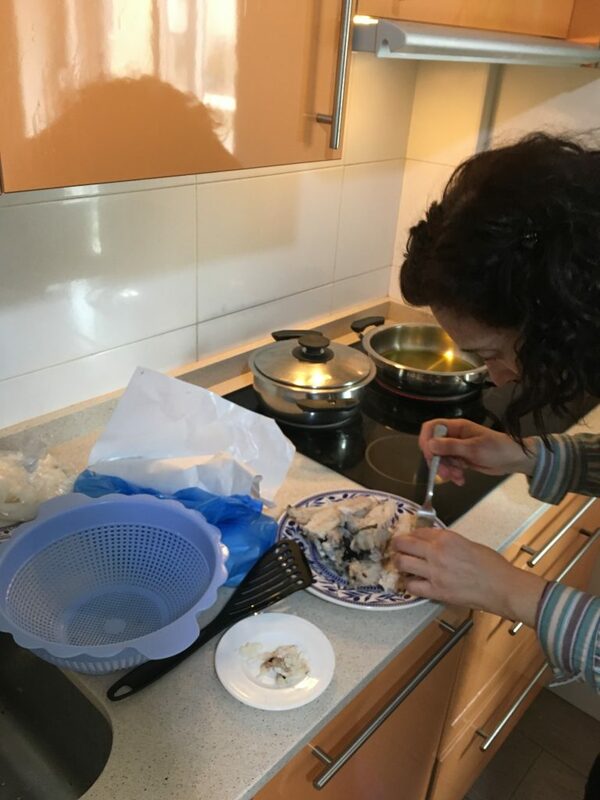 This week my host mom asked me if I wanted to learn how to make this sea-food and rice wonder. I delightfully accepted. So, today, I intend to blog a step-by-step process of what I learned (for my memory’s sake as well as for you all). Although you can always find “recipes” online, my host-mom insists hers is the most authentic. DISCLAIMER: All measurements are 100% eyeballed because according to my mom, “real cooking doesn’t have a recipe”. Let’s begin. 1.) 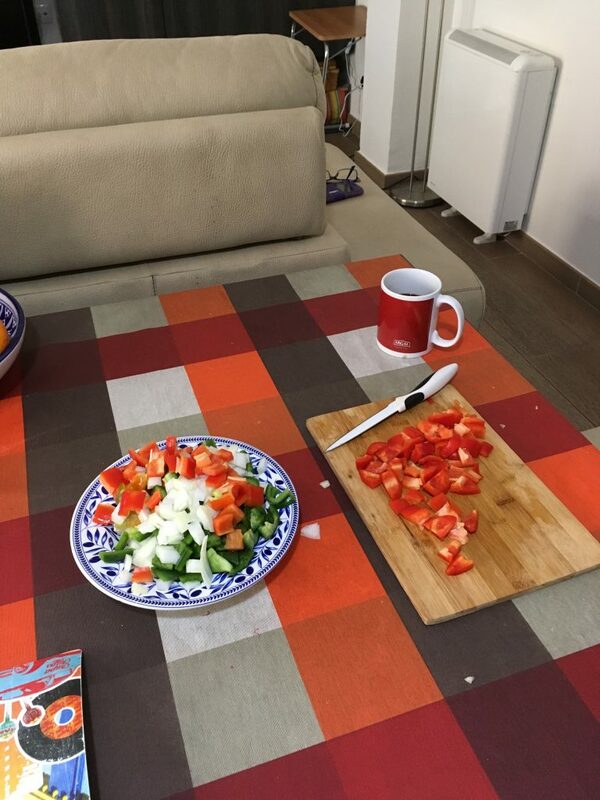 We cut: onions, red peppers, and green peppers. Done. 2.) Heat up some olive oil in a saucepan (pictured below, the pan on t he far right). Once the oil is hot, throw in all your veggies. 3.) The most important part of paella is the broth. This is where all the flavor comes from (there are no spices involved in paella). To make the broth you take basically all the stuff that the fish market throws away (fish bones, fish heads, skin, etc), and put it in water and boil it for 15-20 minutes (that’s what’s in the covered pot on the right). You’re welcome for forgetting to take a picture of this step. 4.) You take out the fish eye balls, bones, and guts, and, leaving the “broth”, throw them away. In the trash. My mom is depicted (above) picking the meat off the “trash items”. This step is optional. She really likes fish, I guess. Now we can get to the real cooking. 5.) Clean (slightly) some fresh mussels and put them into the broth. Boil them in the broth for 5 minutes or until they open up. Take them out, leave the broth. Set aside. Take off the side of the shell without any meat on it. Trash. 6.) Clean some fresh clams. Repeat step 5. 7.) By this time your veggies are probably ready. Take all that tasty fish/mussel/clam-broth you just made and pour it right into your veggie pan with a colander! The colander of course, to sift out the stray fish-eye here and there. 8.) Dump some rice into the mixture (about 1 cup per person) and boil it. You can’t really use basmati rice, or even long grain rice for that matter (the rice has to have no flavor to best absorb the fish flavor). Use round short-grain rice. 9.) Salt indiscriminately. I think my mom had her eyes shut for this part. Not sure. Like I said before, this is the ONLY SPICE/HERB/ANYTHING in this entire dish, and she barely put any in. Less is more, blah, blah, blah. 10.) Clean some fresh fish filet, and throw them right on top. I think you also have to say, “Ole!”, when you do it for it to be effective. (Remember, clean as little as possible in order to leave the flavor of the fish). Choose a fish you like. My mom chose her favorite (and Spain’s most popular paella fish), Monkfish. This fish is perhaps the ugliest living thing I’ve ever seen, but tasted magical. 11.) Cut up some fresh calamari, and throw it on top of this magical boiling Spanish stew. Keep a light boil going throughout this whole thing. 12.) Time for some gambas. Er, I mean, shrimp! Whole shrimp. Head, eyes, and all. My mom used krill instead, but shrimp is most common. Remember, fresh! 14.) Let the mussels and clams heat back up (face down, of course), let the rice finish its last few minutes, and remove from heat. 15.) Put the pot on the table next to a couple of lemons cut in half. Feel free to douse your rice with some lemon juice. This, so they say, is they authentic way to eat paella. 16.) (Below) Serve in giant heaps on your plate and dig in! Make sure you have a communal “trash plate”, where you can throw your shrimp tails, mussel shells, etc. 17.) A glass of white wine is MOST typical, but my host brother is 17 (sorry, man), and also my host mom forgot to pick some up, so water works fine too! Note*** “Old style” paella typically contained saffron, a herb/spice that gave the traditional dish a yellow color. Saffron got too expensive to say the least. Buying enough saffron to make our dish today would have costed us about $50 USD. Since the flavor of saffron “really doesn’t matter or change the dish that much”, we didn’t use it today. I commented on the lack of color (I’ve seen pictures in textbooks, okay?) 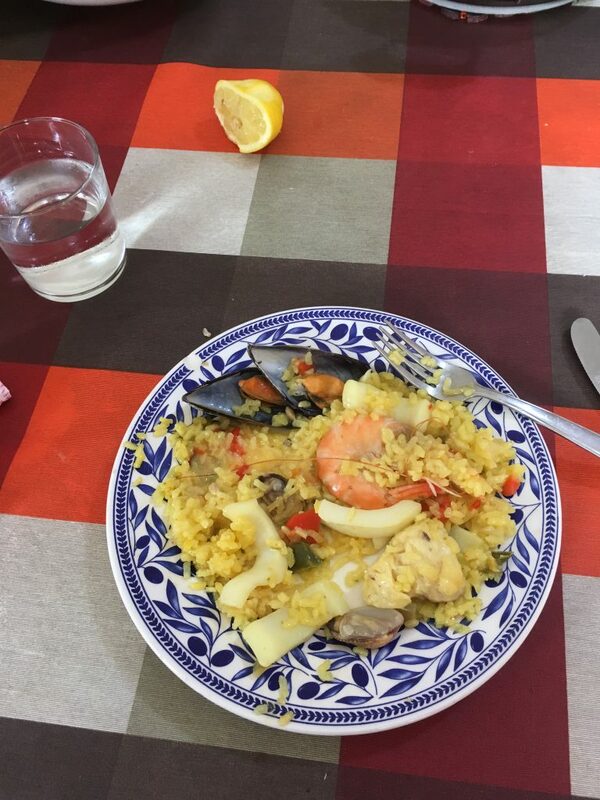 so my mom added some yellow food coloring at the very end just for me, so I could feel like my paella experience was more “authentic”. The things we do for our guests, I guess. Posing in front of spectacular view of Madrid at sunset. What is the best way to capture the life and grandness of Spain?” I would ask myself. I can almost visualize the days flying by to my departure from this treasured land. How can I make it last? How can I portray a general overview of this place that greets me with a load of surprises? One answer I have found is overhead shots of the cities. From such a high perspective, analyzing the “big picture” or capturing the general atmosphere of the places I have been to comes much easier. It makes the pieces easier to put together. That one moment I got lost in that one neighborhood will make much more sense when I see how its buildings fit in with its nearby locations. That one friend I met on that one street will become more memorable to me when I see the architecture and street life that surrounded our encounter. “Zooming out” has really made me appreciate how interconnected my experience has been. It makes me see that whatever struggle I was facing at that time, outside my bubble, there was still beauty, life, and hope surrounding me, whether or not I chose to see it at that moment. Please enjoy these wonderful over-head shots of Spain and be reminded of how interconnected your experiences are with the world around you. Click on the photos to view in slideshow format with their descriptions! View of Cibeles in Madrid taken from the town hall building. A view of a street corner from the ancient wall of Avila. A view of Avila’s Basilica of San Vicente and its surrounding areas. A view of Avila from the heights of its wall. A view of Madrid and its Catedral de La Almudena from a hill near the Debod temple. A view of Callao, a section of Madrid’s famous street, Gran Via. An over-head view of Callao, a section of Madrid’s famous street, Gran Via. An aerial view of Madrid from the tower of Moncloa. An aerial view of Madrid’s Complutense University from the tower of Moncloa. A snapshot of some artful gardens taken from a bridge over the Manzanares river. Me posing in front of a mountain view of Cercedilla, a town outside of Madrid. A semi-aerial view of the picturesque gorges that surround the city of Toledo. A view of Toledo from the one of its bridges. A view of Sevilla from the enormous Las Setas structure. A view of rural land on a scenic train ride from Sevilla. Comically posing on a mountain overlooking Cercedilla, a town outside of Madrid. Enjoying a picturesque view of Cercedilla and its nearby areas from atop a mountain. 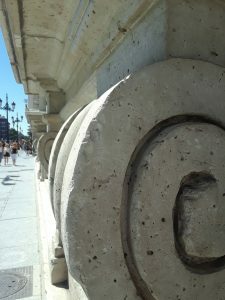 Details of the Royal Palace in Madrid. 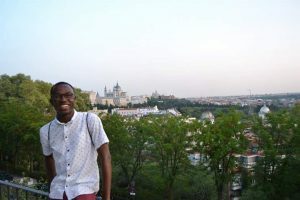 Attractive people, efficient public transportation system, surprises at every corner, and cool-sounding colloquial words are just some of the things I have liked most about my study abroad experience here in Spain. However, one of my favorite things has been the architecture. Even though I am not an expert that can identify the different kinds of styles I have come across, I am a student with a camera that can wonderfully capture their timeless beauty. Click on the photos below to view them as a slideshow along with their descriptions! A beautiful building near the town hall of Madrid. 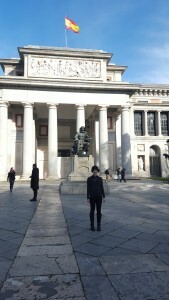 The national Prado Museum in Madrid. The details of the facade of the cathedral within El Escorial. The facade of the cathedral of the Escorial. The cathedral of Toledo is one of the largest in Spain. A beautiful street corner in Madrid. The Almudena cathedral in Madrid at dusk. An artistic structure near the Legazpi neighborhood in Madrid. Las Setas in Seville, Spain. An eclectically inspired building facade in Seville. A cathedral near the tower of Seville. The beautiful inner plaza of the Alcazar de Sevilla in Seville. The Plaza de Espana in Seville. A look at the detailed buildings of Seville’s Avenida de la Constitucion. An interesting orange building near Puerta del Sol in Madrid. A tasteful arc on a building near Gran Via in Madrid. Click on the photos below to view as a slideshow and descriptions! The light passing through the windows’ particles set a great atmosphere for prayer. The interior the sanctuary with an upper balcony. An exterior view of the outside of the cathedral. I do not think I had ever heard the words “recycled” and “cathedral” together like this until CIEE, the program through which I am studying abroad, sent out the cultural activity invitation. Out of curiosity I registered for the event and waited to see how this strange title could unfold. Before the event, I pictured in my mind an old Gothic or Roman-inspired cathedral. Once I would walk in, I would be surprised to find it to be a bustling bazaar or a form of open-air supermarket. I was wrong. The group and I traveled to a small town called Mejorada del Campo within the community of Madrid. 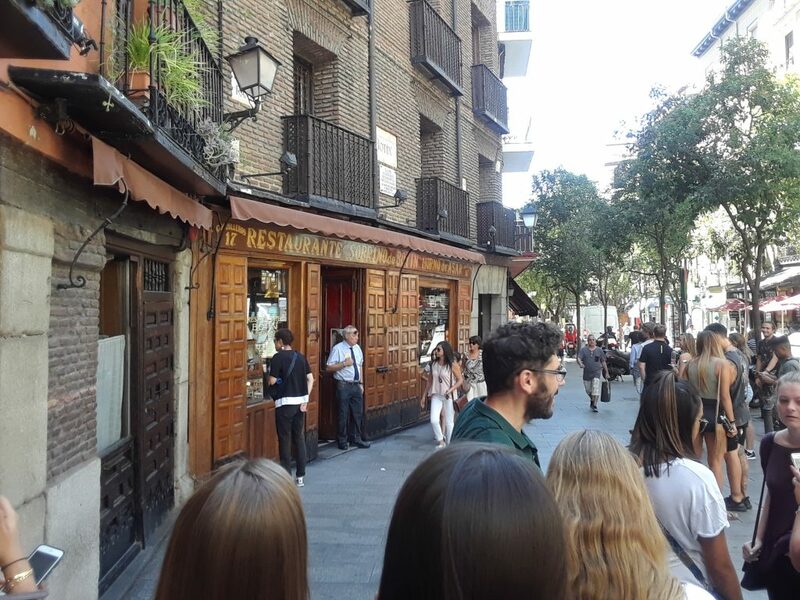 We walked for a good distance past tranquil townhouses, charming restaurants, and even metal barriers that lined some of the streets to protect the locals when the townspeople would hold bull runs! Suddenly, a tall colorful structure began to appear in the distance. As we drew closer, our director welcomed us to the recycled cathedral and I was perplexed by what I was seeing. This amazing and colorful structure was started and is still being constructed by a 92-year-old man named Don Justo. 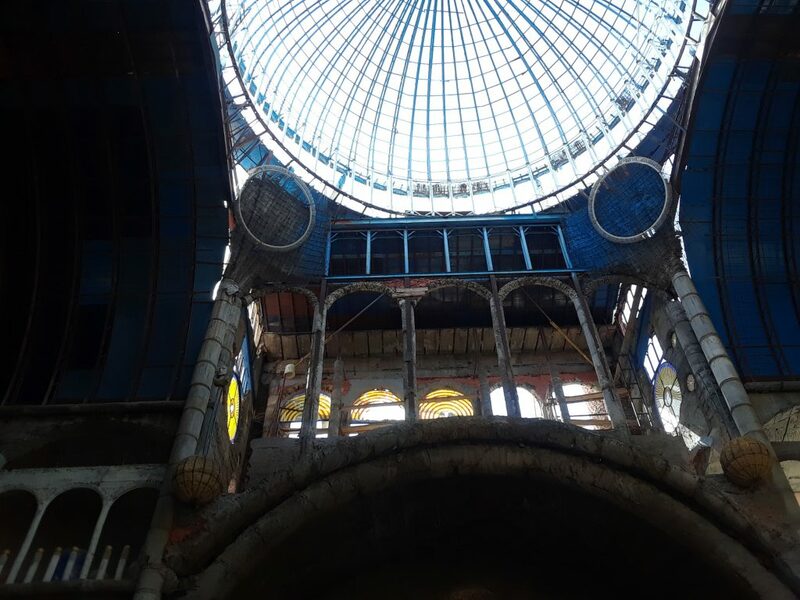 He started the project in the early 1960s and, with his devout faith in God, is still helping with the construction making hand made stained glass windows and mixing cement. A look from below the domed inner sanctuary of the cathedral. Posted on November 27, 2017 Author Miche AndreCategories Academics, Culture, Daily Life, TravelTags Europe/Spain, Spain, Spain/MadridLeave a comment on A Recycled Cathedral? “Medieval walls? Santa Teresa de Jesus? 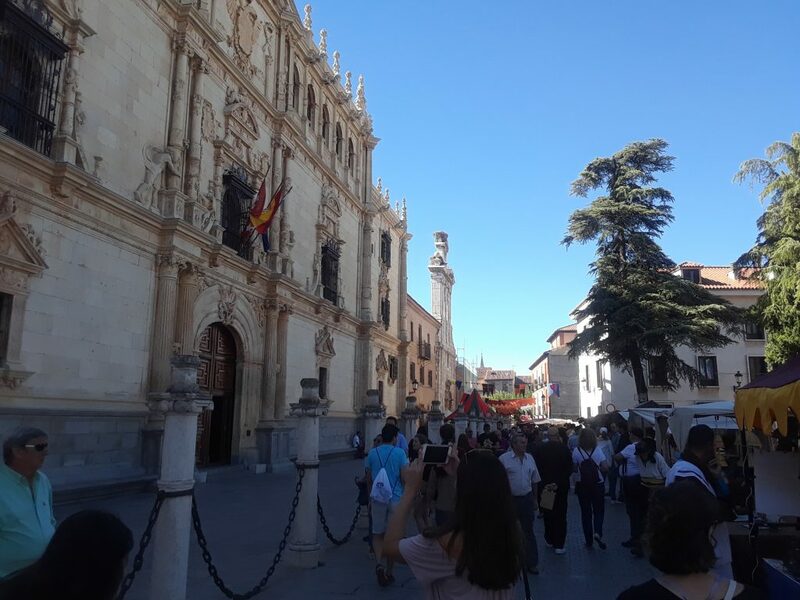 A 16th century home?” were questions that were going through my head as I toured the nearby cities of Avila and Alcala de Henares. I could not contain myself when I found myself face to face with thousands of years of history. What topped off the experience was that both cities were having medieval festivals! One of Avila’s centuries-old gates awaited our arrival into the bustling city center inside. 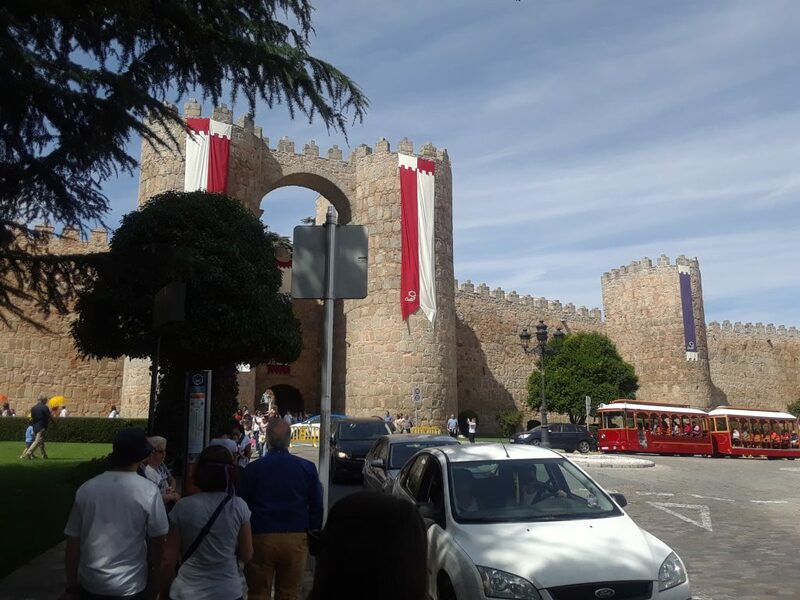 Avila, Spain, which is an old city to the west of Madrid, where I am studying, shattered my expectations as my host mom and I inched closer and closer to the city center where the behemoth wall stood. The wall is almost 1,000 years old and encircles the historic city center. 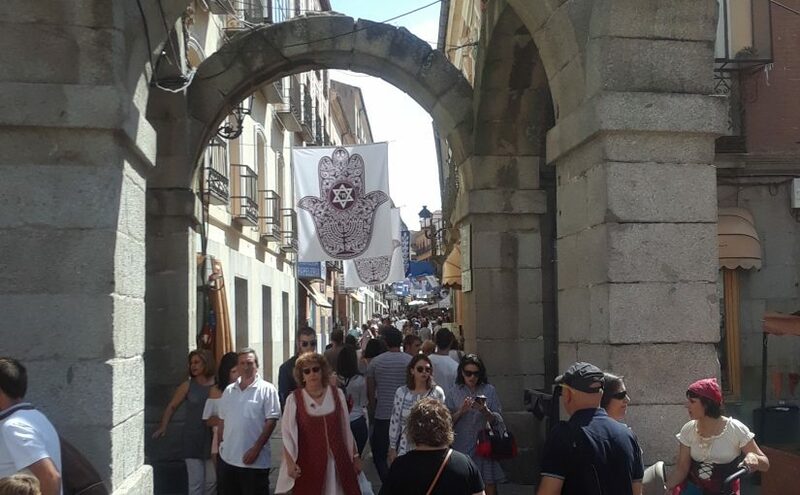 We went through one of the main entrances and were greeted by lively folk music, people in colorful medieval costumes, and a plethora of vendors selling souvenirs and food. 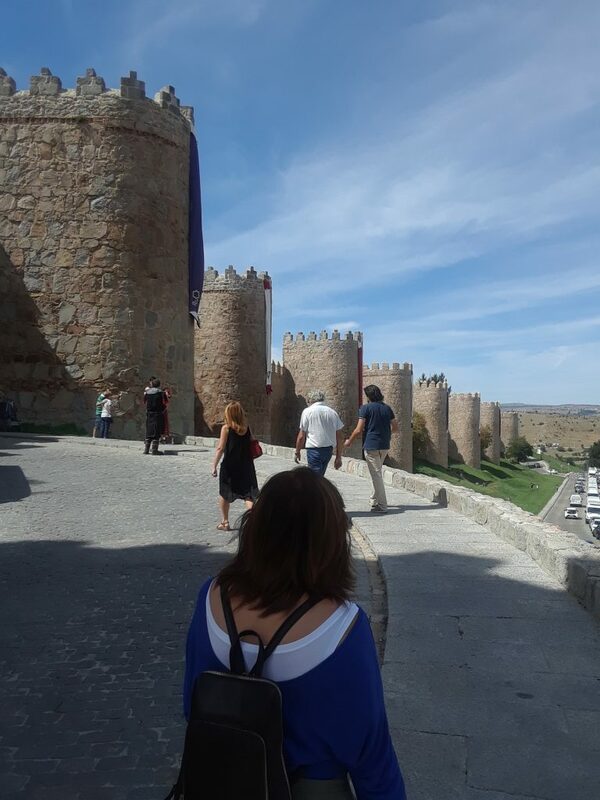 Avila’s ancient wall stretches far and conforms to the hilly landscape of central Spain. 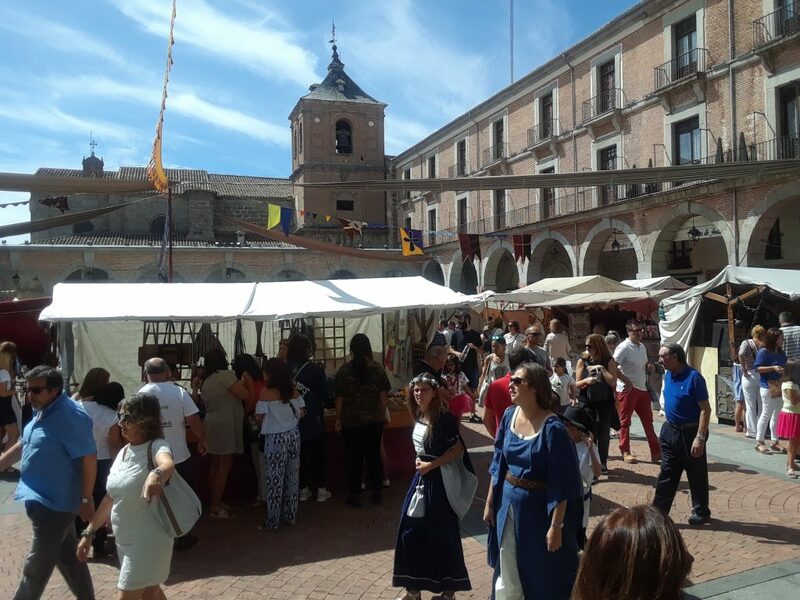 Avila’s “plaza mayor” or central square was flooded with people from all over Spain, enjoying the atmosphere of the annual medieval festival. 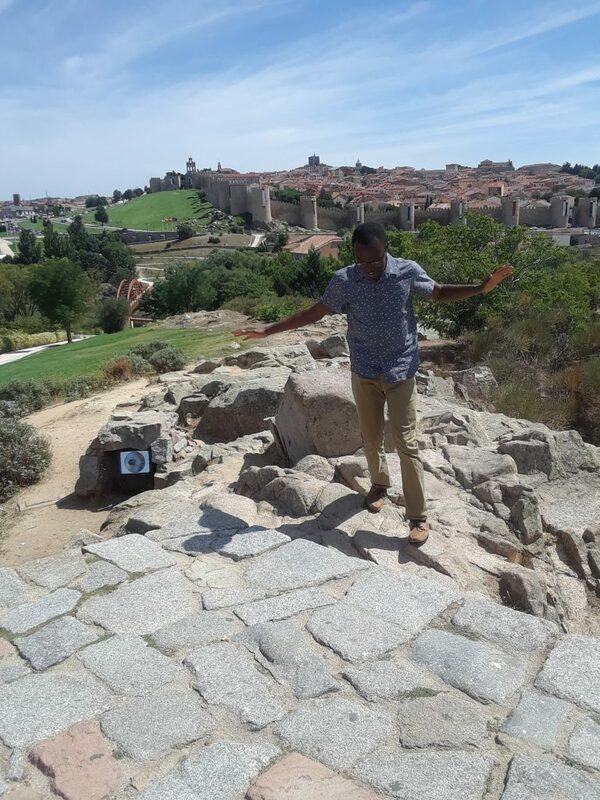 On my way out, I did not hesitate to try Avila’s famous Patatas Revolconas, to visit the ancient Cuatro Postes, or to learn more about Santa Teresa de Jesus who lived in Avila. The inner city’s street were adorned with festive decorations and decorations alluding to religions such as Judaism. 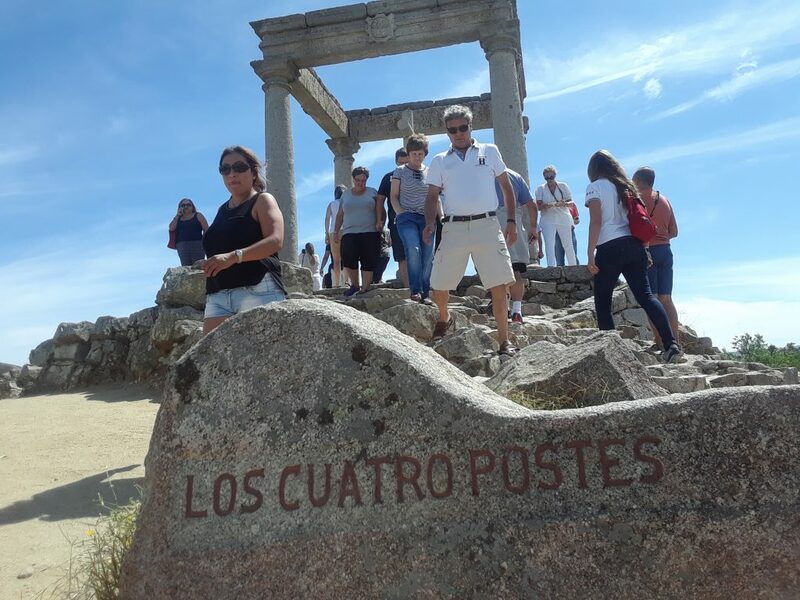 Los Cuatro Postes is an ancient site on a hill with a fantastic view of Avila where it is said that Santa Teresa de Jesus and her brother decided to become heroes for Christianity. Trying hard not to slip, I inch away from one of the best views of Avila and its medieval walls. 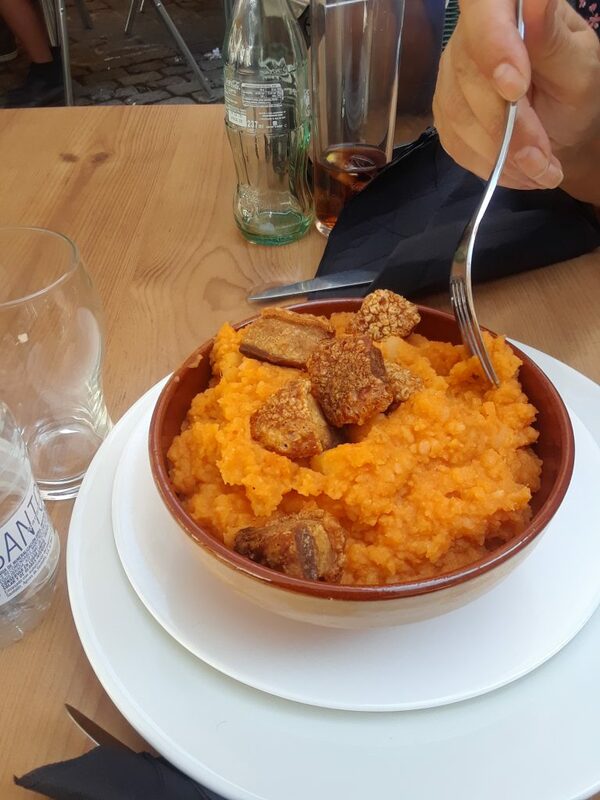 “Patatas revolconas” is a famous dish in Avila made with pureed potatoes and pork meat. This hit the spot! My thirst for history led me further to Alcala de Henares, an ancient city just east of the city of Madrid. I felt honored to stand in a city founded in pre-Roman times. I was able to visit an archeological museum where million-year-old fossils were displayed along with Roman mosaics and other ancient artifacts. I also received a tour of the house where 16th century author Miguel Cervantes, the author of Don Quixote, was born. 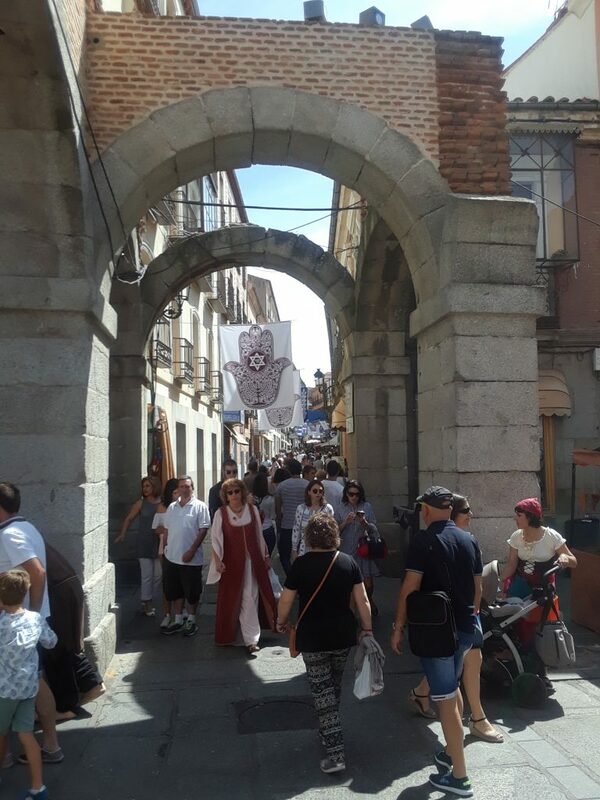 Stepping outside into the streets of Alcala, I found charming streets bustling with people who have come for the medieval festival. Mini parades of people dressed in armor and mystical creatures livened the avenues of vendors. One of Alacala de Henares’s street reminded me of downtown Holland with its short trees, charming store fronts, and friendly people. 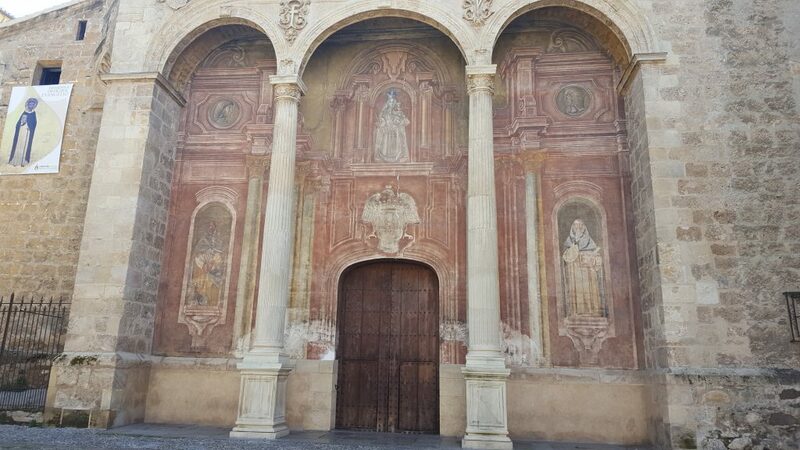 The University of Alcala was founded in 1498, a just 6 years after Christopher Columbus sailed from Spain! 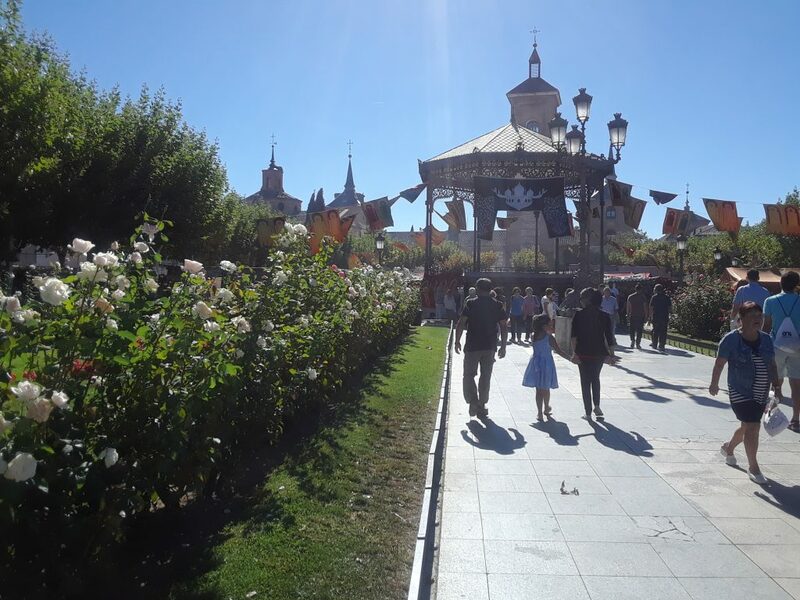 Alcala de Henares’s central square was lively with decorations of varying cultures representing its multicultural history. 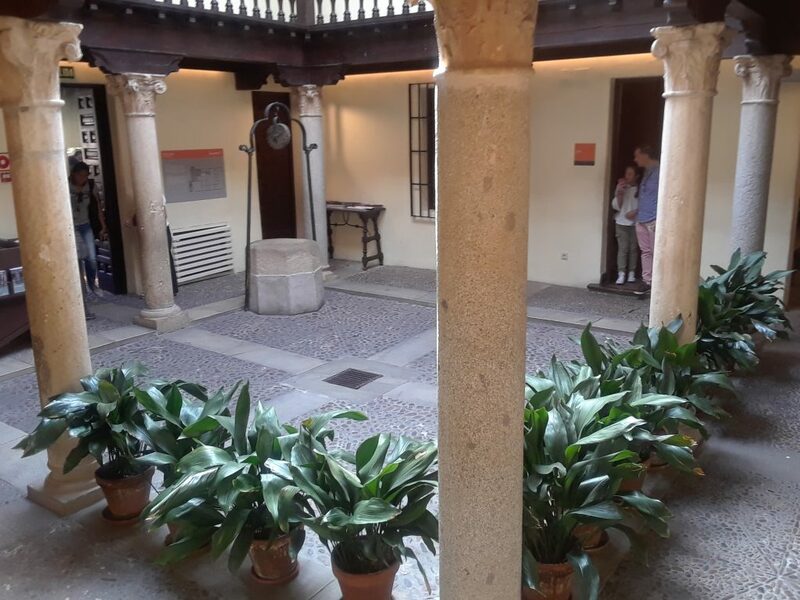 I was able to explore the 16th century home where Miguel de Cervantes, author of the famous book Don Quixote, was born! 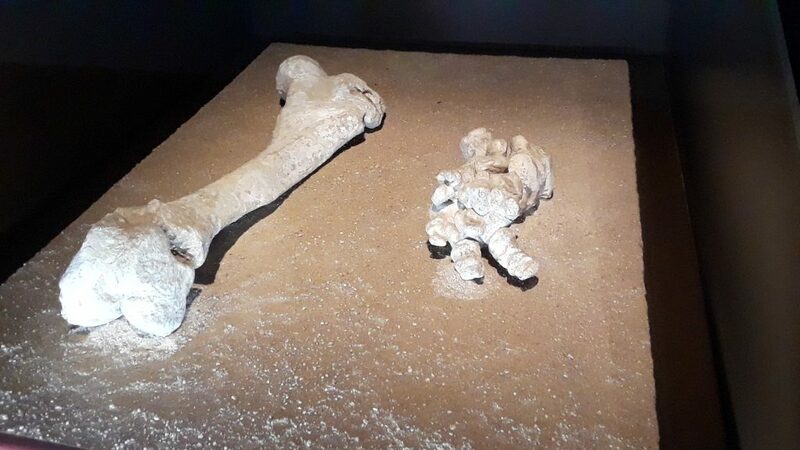 While Alacala de Henares was founded even before the Romans arrived, the city’s archaeological museum held millions-of-years old fossils found in present-day Spain! So much has happened in the past few days that I feel a gallery of photos would better express my excitement for the wonders that I had the privilege of beholding. The enormous Palacio Real (ironically, the king and queen do not live here), the beautiful and monumental Almudena Cathedral where the current king and queen of Spain held their wedding, the awe-inspiring Madrid town hall (El Ayuntamiento de Madrid), and the oldest restaurant in the world (el Restaurante Botín, which was founded in 1725) are just a few of the sights that made me beam with life. 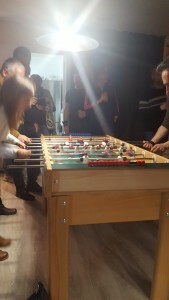 Posted on September 4, 2017 September 11, 2017 Author Miche AndreCategories Academics, Culture, Daily Life, TravelTags Europe/Spain, SpainLeave a comment on ¿Dónde empezar? Bon dia! 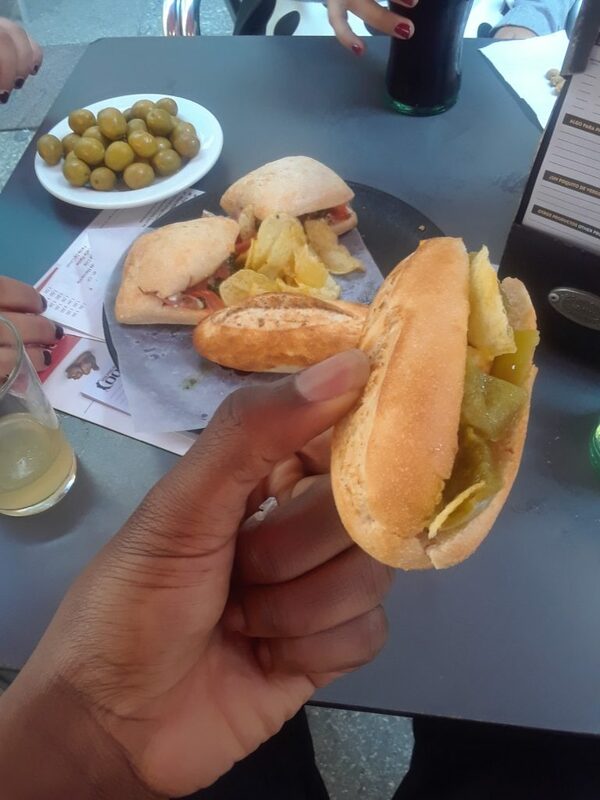 Over spring break I visited Spain for the first time. Our spring break lasted from March 16 – March 19 (basically the length of fall break at Hope) so I had a short time to visit as much of the city as possible. This was a popular travel weekend. Flight prices were getting expensive once I factored in all the attractions I wanted to see and my food budget, so I decided to take an overnight bus on Wednesday, March 15. The ride itself took over 14 hours, including breaks, but it honestly was not as bad as I expected. I ended up having two seats to myself, and there were outlets at each seat as well as Wi-Fi. 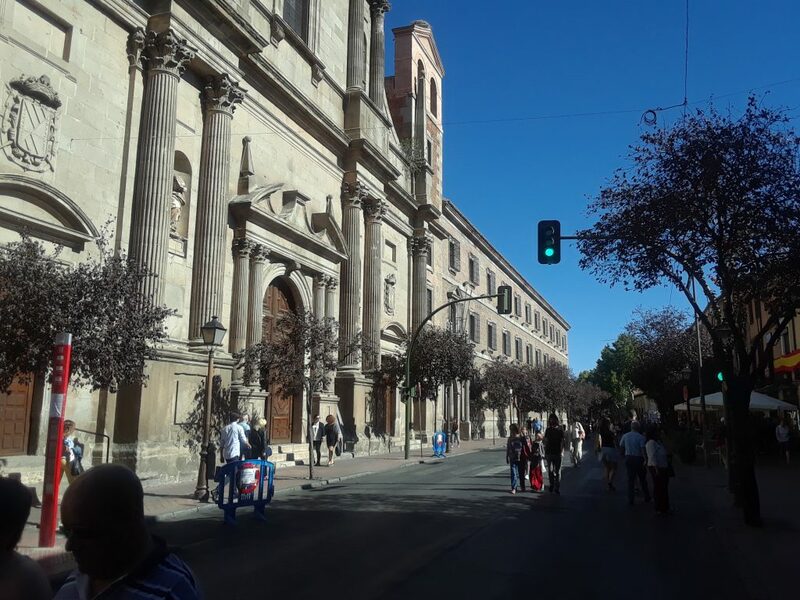 I arrived in the city early in the morning and set off walking towards the Latin Quarter where I wanted to see the Picasso Museum and the Barcelona Cathedral. 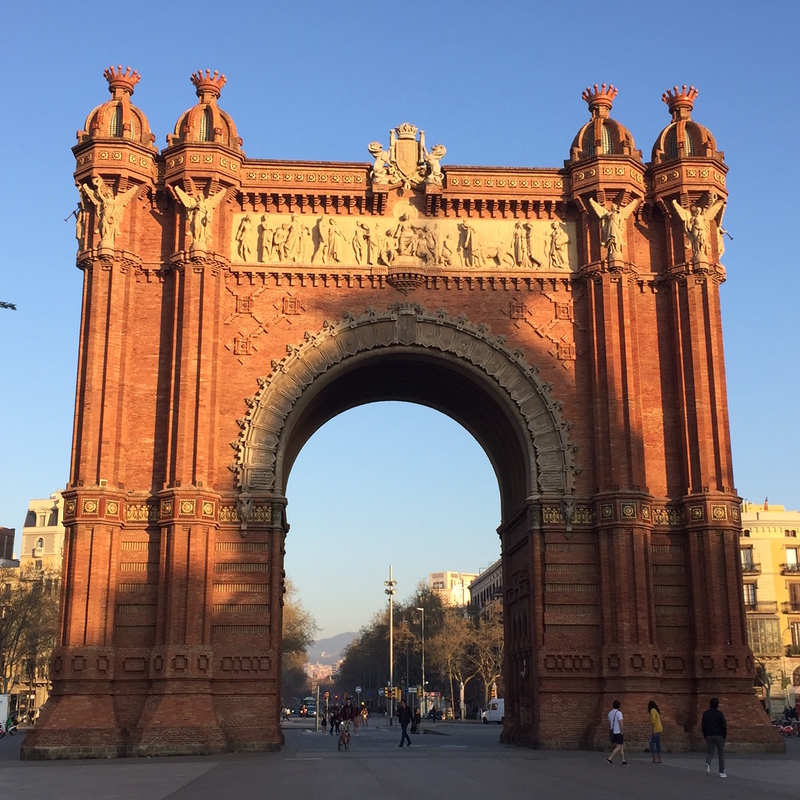 The beautiful Arc de Triomf, built for the 1888 World Fair in Barcelona. 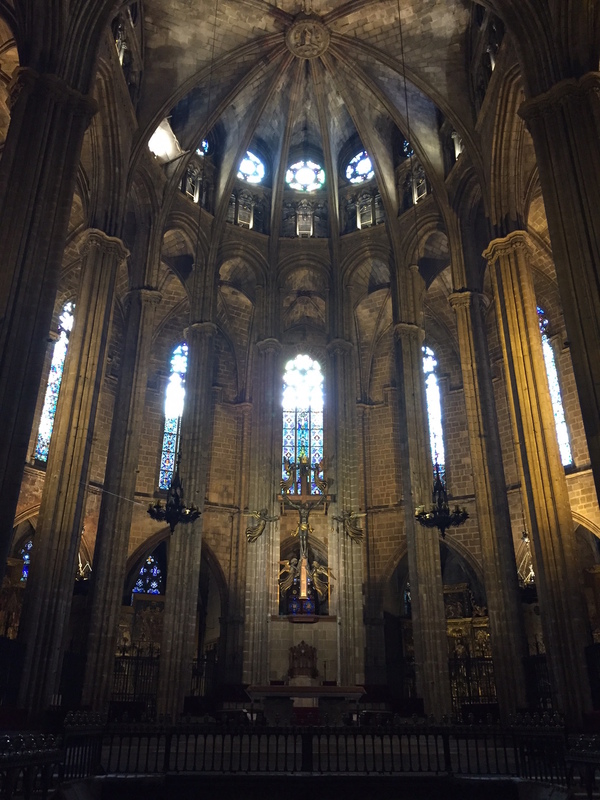 Inside the Cathedral of the Holy Cross and Saint Eulalia (Barcelona Cathedral). I loved the Picasso Museum (sorry, taking pictures inside was not allowed) because the collection was supplemented by descriptions of changes in the art world as well as changes in Picasso’s life. It created a better understanding of the pieces. After walking to my hostel and getting dinner, I took public transportation (bus and metro) to the Bunkers del Caramel. 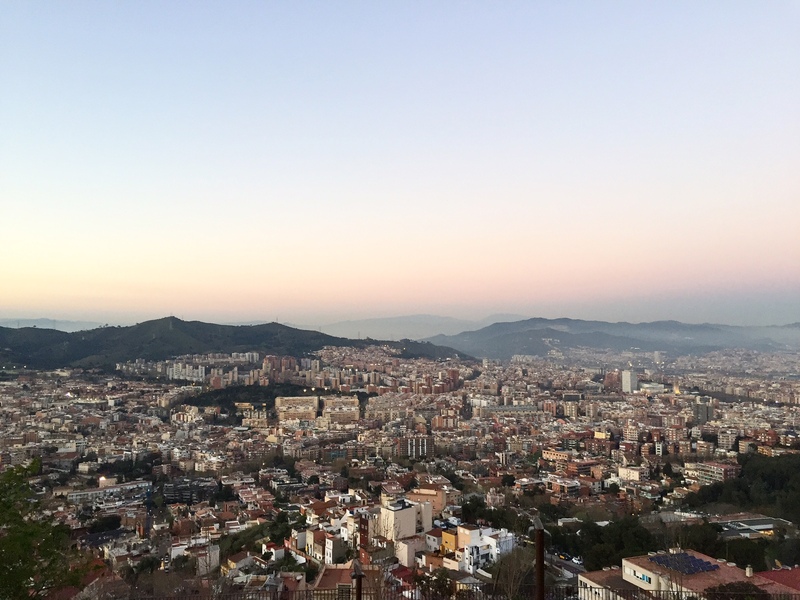 These old Spanish Civil War bunkers offer some of the best views of the city. It was a little nerve-wracking; the last bus to get up to the bunkers was more like a rickety school van, speeding through the hills. But watching the sun set over Barcelona was definitely worth a little motion sickness. I dedicated the next days to the architecture of Gaudi. 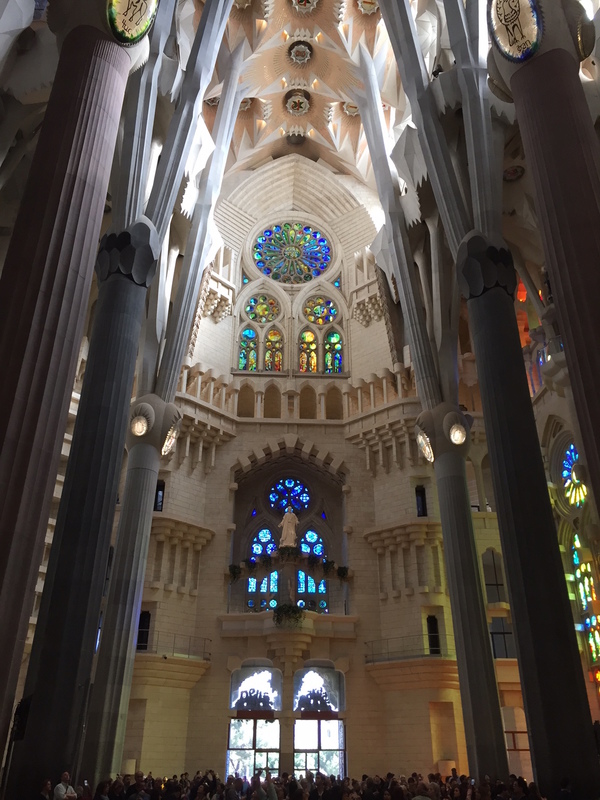 I recommend buying tickets online to avoid longer lines and get a discount at major attractions such as Sagrada Familia and Parc Güell. You also get to choose the times that work best for you, so you can plan your day accordingly. Construction is still underway on the facades of the Sagrada Familia, expected to end in 2026. Gaudi designed the interior (pictured) to mimic tree branches. Church services are also held inside. Got a tan (and some blisters) walking around Gaudi’s Parc Güell. On my last day, I relaxed at one of Barcelona’s many beaches with some seafood paella before catching my flight to Paris. If you’re able to visit Barcelona, don’t hesitate! 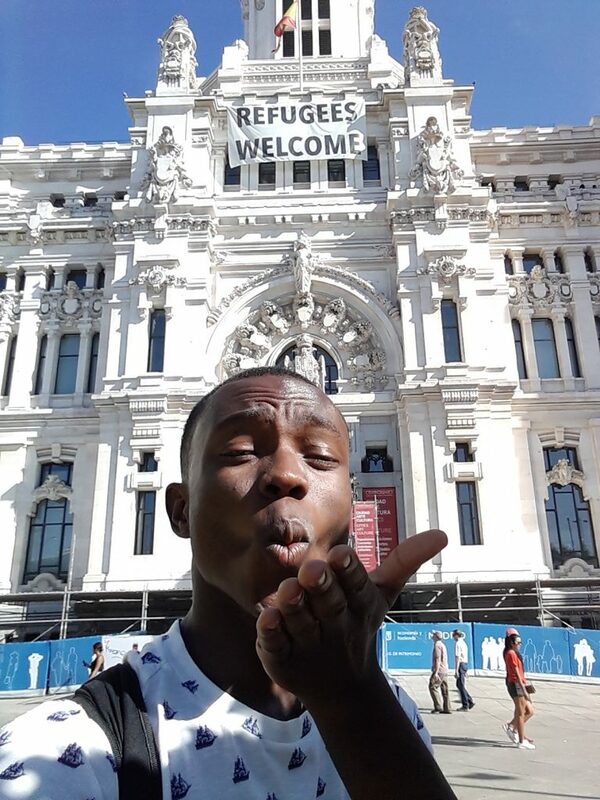 The city is stunning and the people are welcoming. I was able to practice my (very minimal) Spanish, but I never felt judged asking to speak in English. 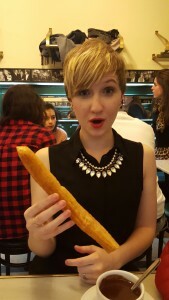 If you learn a few phrases in Catalan before you go, you may get an even warmer welcome – I got a free pastry with my coffee for trying a few phrases. 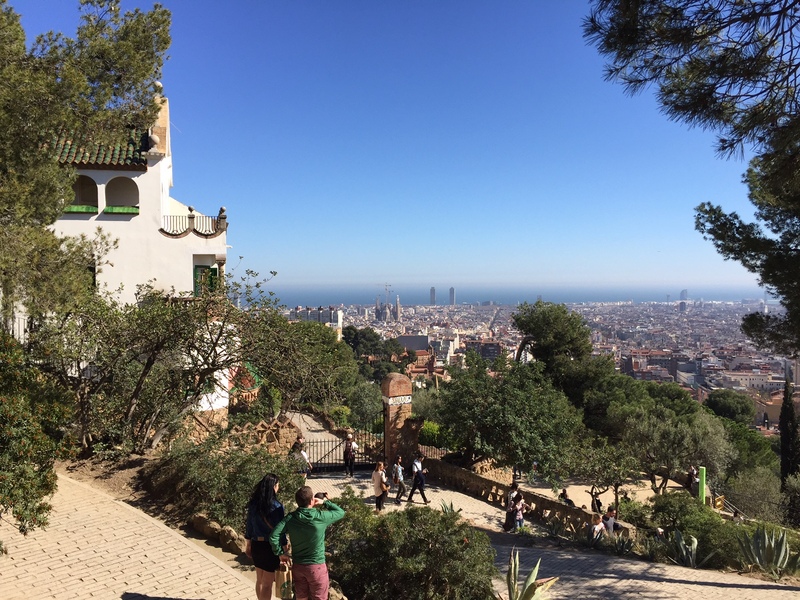 Barcelona is an extremely walkable city, but I would suggest getting an HOLA BCN pass when you want to visit sights further from the city center such as Parc Güell, and to take the bus to the airport. You can buy passes online for 2, 3, 4 or 5 days. One of my courses here at IES is Historia y Memoria de los Judíos Sefardíes or History and Memory of the Sephardic Jews. Through this course I have been learning not just about the Jews of Spain but naturally the historical context as well, therefore giving me a broad understanding of Spanish history. Semana Santa taught me about Spanish Catholicism, Morocco and my Islamic Art and Architecture course is teaching me about Islam, and this course is covering Judaism. I am of the strong opinion that learning about other religions is extremely valuable as a Christian to better understand my own faith in relation to others as well as gain the ability to converse with people from other faiths in meaningful dialogues. I will spare you most of the details and dates by saying the Jewish culture is vibrant and persistent despite constant expulsion, segregation, prejudice, and even forced conversion. In 1492, the same year that Christopher Columbus landed in America, the Catholic King Ferdinand and Queen Isabela la Católica signed the Edict of Expulsion stating that the Jews of Spain could either covert or leave Spain. Though many left, some did stay and “converted.” However, the term criptojudío came into being as many Jews outwardly converted but inwardly maintained their faith. Granada is home to the location at which the King and Queen signed the edict. Ironically it is situated in the old neighborhood of the Jewish Judería. In addition to learning through my course, one of my good friends in the program is a well-versed and practicing Jew. Ari Levine has taught me about his cult ure and religion throughout this semester and I am so grateful! 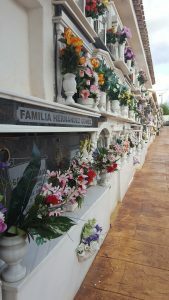 For example, we happened to walk through a small cemetery and as we were walking, Ari stopped to place small stones on any headstone we paused to observe. I asked him why he was doing this to which he replied that it is a Jewish custom and sign of respect for the dead. Through his faith Ari shows respect to heavily Catholic Spaniards who have passed on even though the Catholics are responsible for a fair amount of hardship for the Sephardic Jews of Spain. 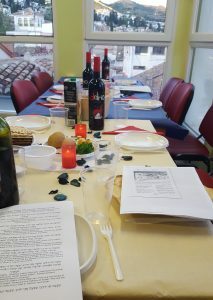 Another means by which I have learned much about Judaism attending IES Granada’s very own, student-initiated Seder meal! 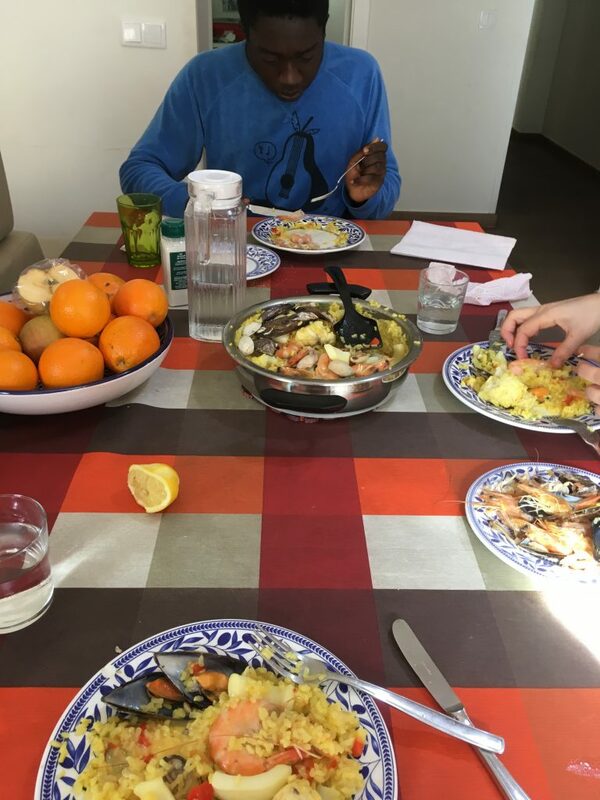 Even though I am a Christian, I have celebrated the Seder meal for Passover before. In my personal opinion, Christianity follows the Bible, a book about the Jews, so I do not know why the Jewish Seder meal honoring the memory of their salvation from Egypt by God should be excluded from Christian traditions. But I digress, the Seder at IES was filled with laughter, contemplation, learning, and good food! We had the traditional elements such as the salt water symbolizing the tears of the slaves and the unleavened matzah bread to serve as a reminder that the Jews fled Egypt without enough time to let their bread rise. We also had to get a little creative. For example, finding a shank bone was all but impossible, so one of the main organizers went to a Kebab shop and asked for a chicken bone! We all could not help but laugh as the tiny chicken was raised in the air during its moment of the Seder meal. 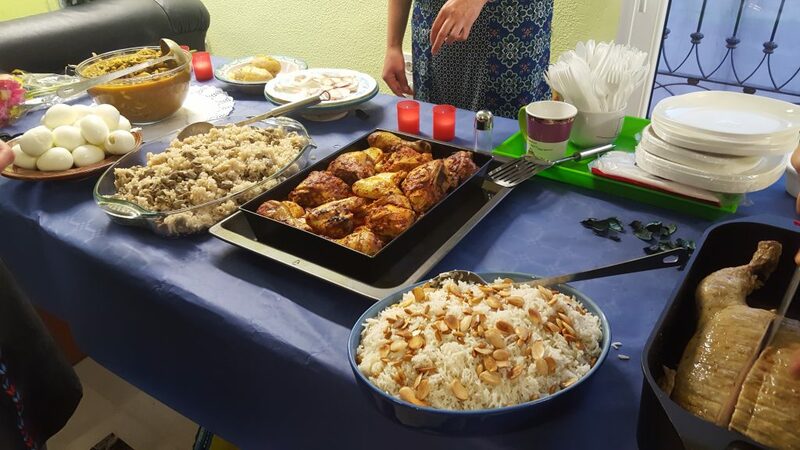 In addition to the elements of the Seder meal, we had a delicious meal complete with rice, chicken, eggs, and ice-cream for dessert. Those who were Jewish (though all were welcome, such as myself) sang traditional songs, too! Take a listen. The entire experience was very eye-opening about Jewish culture. I feel so fortunate to have witnessed an integral part of many of my classmates’ lives, as well as learn about a faith and culture different, but not so different, from my own. 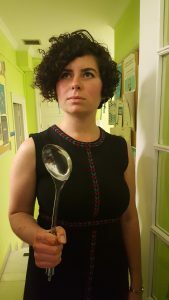 Micro-bio: Elana! Elana is a charismatic, poetic Jewish classmate from Kenyon College in Ohio. Her personality is as vivacious as her hair. She wants to be a writer and I admire her for her vigorous note-taking and journaling throughout our semester. She is easy-going, spontaneous, and averse to strict planning, making us rather opposite in many ways; however, we have great conversations. One of my favorite quotes of her is: “When someone is talking about something he or she is passionate about, that’s really attractive.” I think she is 100% right. I think encouraging passion and drive is invaluable and I wish there were a greater emphasis on cultivating it than memorization and so forth. Recently we discussed the complex topic of women’s rights and feminism. We both agree that too often society has established when a woman can complain and when she is “overacting” or “misreading a situation.” Instead, if a woman feels uncomfortable in a situation, it doesn’t matter whether or not the situation is in fact dangerous, misunderstood, or questionable; what matters is that she feels uncomfortable and has every right to leave or make requests to amend the situation. End feminist rant. Elana has been a fun, kindred spirit to get to know this year. Please enjoy this dramatic photo of her. On occasion we have a long weekend in which we don’t have classes on Monday. Naturally this means we have time to travel around Spain. For our first long weekend I w ent to Madrid, capital of Spain. Madrid is like the New York City of Spain, but prettier and less structured. With the largest city population in Spain of over 3 million it is definitely a monstrosity, but the beauty of winding streets and big plazas make it feel less oppressive and daunting. While there I got to indulge my artsy, high society side. My friend, Ari, and I went to a total of three art museums and my were they magnificent. The first museum is called the CaixaForum which hosts a small but interesting array of contemporary art. The building itself is unconventional. Switzerland’s Herzog and De Meuron are the architects of the unique space. Here is a picture of the stairwell inside. 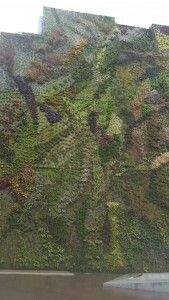 Just outside the building is a wall named the vertical garden. French botanist Patrick Blanc constructed the garden with 15,000 plants of 250 different species! It was really gorgeous, even in the rain. two large glass elevators. The view is dauntingly beautiful. 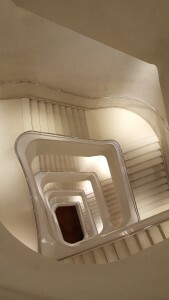 The Reina Sofia has several temporary exhibitions as well as some famous Vanguard art. We saw Dali’s handiwork as well as many Picassos, including the incredibly famous Guernica. It was truly a site to behold. The third museum we visited was, of course, El Prado. Paintings from masters like Goya, Velazquez, and El Greco decorate this enormous museum. Ari and I spent 7 hours admiring all that we could; we are pretty confident that we did indeed go in every room and see (although sometimes only at a glance) every painting in the museum! The temporary exhibit at the time was by Ingres, a famous Frenc h neoclassical painter. I enjoyed how much he played with light in his paintings. Candles were a common theme, casting distinct and unique shadows on his subjects. El Prado was a breathtaking experience that I might have to have again before I leave Spain. In addition to museum perusing, Ari and I explored the city. The plazas are huge and beautiful. We found the Palace of the Spanish royal family, saw numerous interesting stores─such as a used bookstore where we bought Spanish poetry─and discovered the best Churros place ever. 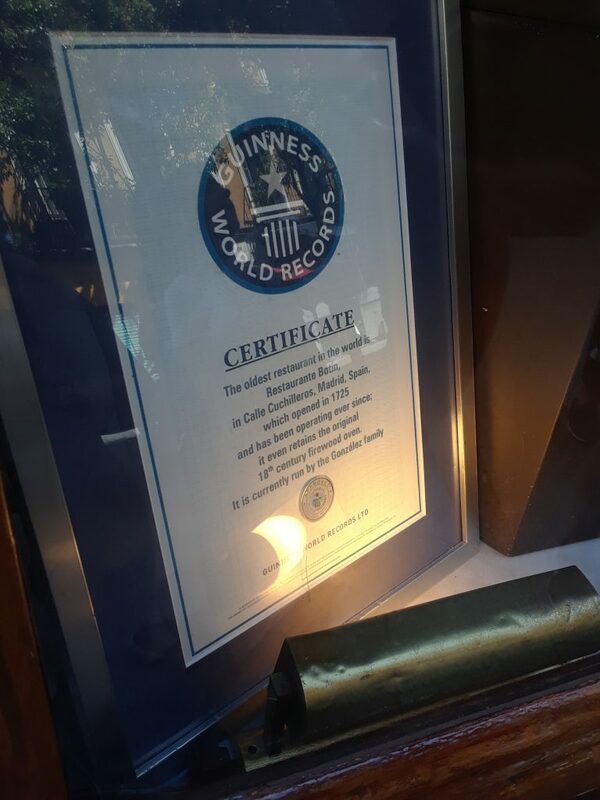 San Gines is a 24/7 Chocolatería celebrating its 100th year. The chocolate is indeed to die for and their churros are gigantic. 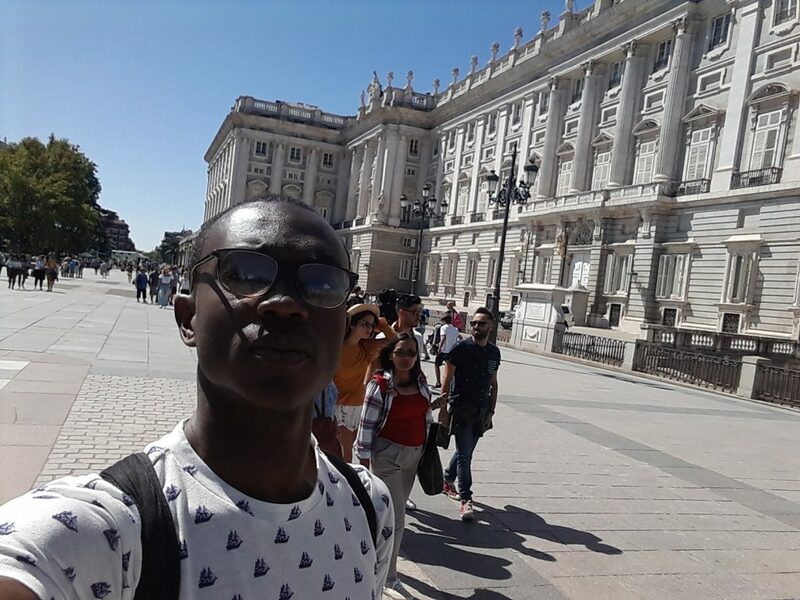 We have no shame in saying that we went every day for the three days we stayed in Madrid. 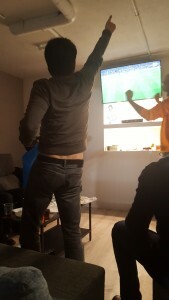 I was very excited, as this picture makes obvious. Just look at it! We also spent several hours wandering the streets during El Rastro, the largest outdoor flea market in Spain. Here you can buy anything from scarves to knives, shoes to doorknobs, and everything else in between. Afterwards we went to the food market where I had some delicious paella. Ari got gulas on toast, a food we have come to love. Gulas is the name for a special way of preparing a fish. The fish is sliced very thinly so that it looks like thick, short pasta. This with garlic and olive oil is delectable. We had another great food moment when we found a bar called Las Cuevas, or The Caves. The name is accurate. To enter the bar we went down very steep and narrow stairs. The ceilings were curved and low, there was a live pianist playing to his heart’s content, and posters of famous paintings decorated the walls and curved arches that connected the ceilings and floors. It was “guay” as the Spaniards say (“cool”). Here’s a sound byte of what a Spanish bar typically sounds like, with the addition of a pianist! To top off our highly cultured and artsy weekend we saw a ballet! 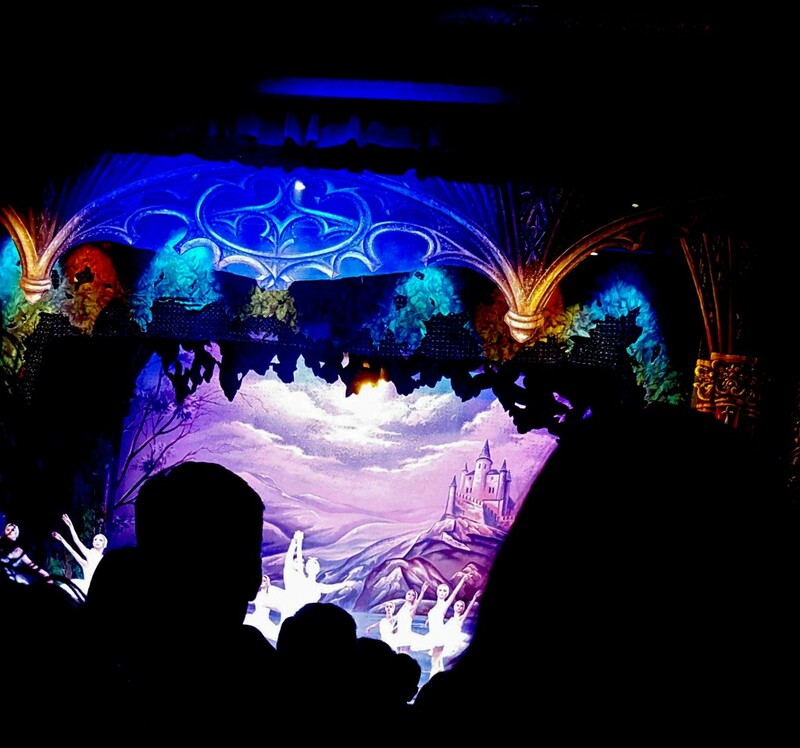 As the sister of a dancer, I had heard about Swan Lake, and now I can say that I have seen it performed in Madrid. The costumes were gorgeous, the dancers were lovely, and the whole evening was unforgettable. While I would not want to live in Madrid, visiting for a weekend kept me busy and overwhelmed with awe and joy. For any lovers of the arts, I recommend Madrid for a day or two. For this week’s microbio, meet my intercambio, Ana! 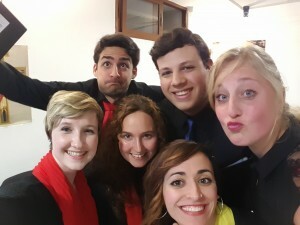 (An intercambio is a Spanish student who gets paired with an American student to practice their respective second languages and make new connections.) Ana is from Cadiz, the beach city that hosts Carnival. She is a freshman at the University of Granada studying English and Spanish literature. She enjoys reading and painting in her spare time, but don’t mistake her for shy; she frequently dresses in costume with her friends at fun parties and clubs in the local area. She speaks English quite well and is sweet b ut strong. We have had some great conversations about music, the importance of travel, leaving your home bubble, and family. “Leaving your town is so important because you get to grow. I feel like all my friends who haven’t gone anywhere are the same. I don’t want to be the same as I was in high school!” There is a lot of value in staying near home, especially for family, but I think we can all agree that at least visiting other places leads to so much growth. (And yes, she said that in English!) 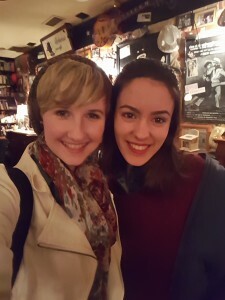 For our most recent get together we went to this really cool cafe/bar called Bohemia Jazz Cafe. The walls inside are coated with funky paintings, pictures, obscure items, books and whatever else; there is also live jazz piano music on certain days. The cafe is known for their drinks, desserts, and combinations of the two. I had a scrumptious ice-cream sundae. We had a great time and will continue to meet up throughout the semester.